Thieving is definitely one of the most interesting skills in the game, with a variety of things for both the casual thief and the professional kleptomaniac to practice on. This Members-Only skill gives you the ability to pickpocket quick cash from characters, steal tasty cakes and disarm dangerous traps that you may run into while adventuring. One of the most fun Members skills in RuneScape is Thieving, as you can find a great number of things to do with the skill. When you first start off you can only enjoy a small part of the countless bounties to be earned from your new-found forte, but as you get more skilled a wider range of things can be done with it. There are several things that you can practice your thieving on as you get better, but remember that you need to be both stealthy and cautious. Each activity has a dangerous side to it, from a not-so-tough Man stunning you, to a Knight attacking you with full force. Every thief should start his (or her) day off with a frosty glass of Bandit's Brew! This drink temporarily increases your Thieving level by 1 when you drink it, and you can buy one for 650gp at the Desert Bandit Camp. By far, pick-pocketing a character in the game is a great way to begin thieving. For a beginner thief, NPC's will give plenty of experience so that you can move on to more difficult ways to thieve. Not all characters in the game can be pick-pocketed but many can, so check the Pick-Pocketing chart for more info about these characters. Begin by finding a Man or Woman and right-clicking him or her. Choose the Pickpocket Man option, and you will try and steal from him. If you're quick enough, you will pocket a few coins, but if he catches you trying to steal from him you will get hit and stunned for several seconds. Depending on the character you steal from, you could get different amounts of coins, or even various items such as Runes or weapons. However, the higher the level required to pickpocket the NPC, the harder it will be to steal from them, and the chance of getting caught will be greater. Farmer 10 14 Farms around Lumbridge. Female HAM Member 15 18.5 H.A.M. Hideout, northwest of Lumbridge. Male HAM Follower 20 22.2 H.A.M. Hideout, northwest of Lumbridge. Master Farmer 38 43 Draynor Village, North of East Ardougne, farm east of Champions' Guild. If your Thieving and Agility levels are high enough, there is the possibility of pickpocketing your victim multiple times and stealing extra loot from him or her. There's a chance that you can steal up to four times the regular amount of loot from an NPC, which will also result in you receiving bonus Thieving experience for your stealthiness. When this occurs, you will see your character pickpocket the NPC while alternating his or her hands to steal extra loot. Stealing from the various market stalls in Ardougne, Ape Atoll, Rellekka, Etceteria and Micellania is one of the best aspects of thieving. You can steal anything from delicious cakes and pies, to shiny pieces of silver and valuable emeralds and rubies. Of course, the marketplace is heavily guarded by the stall owner, guards and knights. If the stall owner catches you, he will call over the guards and they will attack you! When a stall has loot in it, you will see exactly what you can steal. 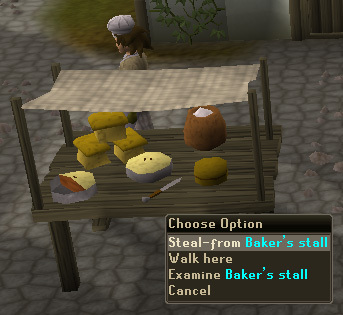 To steal from a stall, you can either just click "Steal From Market Stall," or you can right-click to bring up a menu of options. Even if you see a group of people stealing from a stall, you have a good chance of looting it as long as you click fast enough. Everyone has a chance to loot the stall at the same time! Stealing from a stall may sound easy, and on a good day it is, but those pesky guards are always on the lookout. It's best to hide behind the stalls, on the side facing away from the guards. Since they can't see what's happening on the other side of the stall, you're safe... except for the Knights. You just have to watch for them, and as they approach you, stop thieving. Completion of the Monkey Madness Quest is required before you can loot any stalls on Ape Atoll. Completion of the Fremennik Trials Quest is required before any stalls located in Etceteria or Miscellania can be looted. Sometimes you may come across a locked door inside of a building. Of course, a key would be helpful but what if there isn't one that belongs to the door? Well, that's when you use your thieving skill to pick the lock and get inside, and to a good thief it's a cinch to get in. 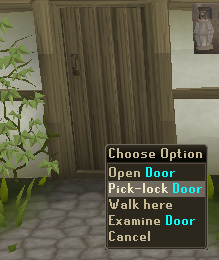 To attempt to pick the lock of a door, just right-click it and select "Pick Lock Door." If you have enough experience at thieving you will open the door and enter inside.Once a door has been opened, you don't have to pick the lock again to leave. Remember though, that you'll need to pick the lock again to go back inside after you leave. A Lockpick can be of great use to any thief. You can steal them from Rogues at level 32 Thieving, or Bandits at level 53 Thieving. They allow you to open doors that would normally require a higher thieving level. By picking a lock with it in your backpack, you may have an easier time opening doors as well. You may also need to have a Lockpick in order to open some doors. Ardougne Sewers 32 25 The sewer is found north of the Zoo. Not only does your thieving skill give you the ability to steal things, but it also allows you to disarm a trap on a staircase or treasure chest. A trap could poison you, teleport you, or cause other damage, but by disarming the trap you can easily access the treasure in the chest, or walk up the stairs. 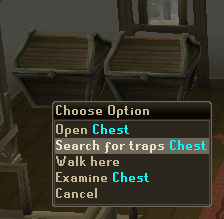 To disarm a trap on a treasure chest, you need to right-click it and choose "Search for Traps Chest." Your character will attempt to disarm it, and if successful, will open the chest and take any items inside. Some chests contain coins, while other may have Runes or other items inside. To disable a trap on a staircase, select "Investigate Stairs" to find the trap. Be careful, because the trap will be reset later on. 2 Blood Runes & 500gp 59 250 In the Blood Rune Chest Dungeon.